The Minnesota promissory note templates have been specifically designed for transactions involving the lending of a monetary balance between two parties. The template helps to ensure that the lender of the balance is reimbursed the full amount of the note plus accumulated interest. To ensure the legality of the agreement, both parties should ensure a legal interest rate (also called a usury rate) is selected by checking out the Usury Rate section at the bottom of this page. 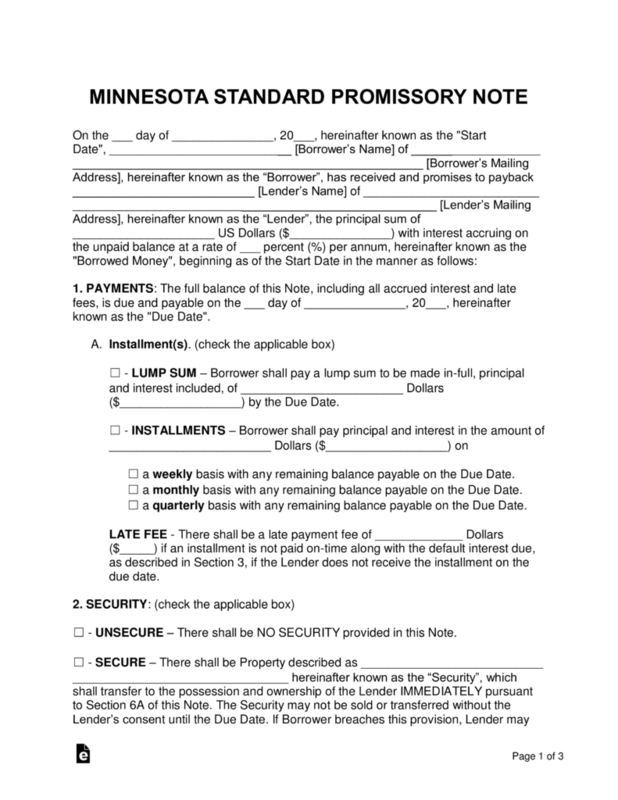 Secured Promissory Note – This version of the note includes a section on security. This sets aside a possession of the borrower (typically a home, vehicle, or boat) that is used to help cover the cost of the loaned balance in the case of a default. Unsecured Promissory Note – This version does not include security, meaning the lender is at a far greater financial risk. We recommend the lender only work with family, close friends, or those with a worthy credit score to help lessen the risk.